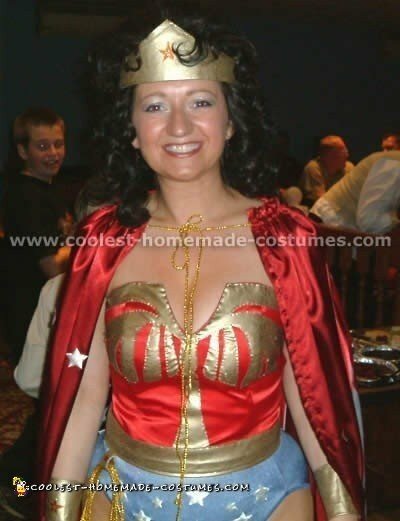 I had thought to hire my Wonder woman costume but got inspired to make my own after being disappointed at what was on offer at various local costume stores. I had much more fun putting the whole look together in the end. I already had a pair of red boots so I just put white insulation tape over the centre of the boot and on the top edges. I found this blue pair of gym shorts at Supre which was the perfect colour and my friend Denise gave me some iron on transfer paper (which irons on clear). So I just cut out some stars from white material a couple of millimeters smaller than a star cut out from the transfer paper. I put the white material star onto the shorts the iron on transfer cut out star on top and ironed the paper until it changed colour. Upon lifting it off carefully the star was bonded to the shorts. Be careful when you do this else the iron on transfer shrivels due to too much heat! I also found this red tube top at Supre and I bought some vinyl (you know the kind for flooring – bendable but firm with a sticky side) and cut out the WW insignia and spray painted them a metallic gold. I put the WW insignia on last when I was already wearing my Wonder woman costume. You just peel the sticky backing and pop it on the top. So judge your positioning in a mirror. My friend Jessica had some spare thin gold material which I just folded down to the size of the belt I wanted. Then, I sewed an edge to keep it together and added some hooks and eyes to the suit my shape on where I wanted it to sit so it would clip together well. More vinyl this time a triangle-type shape which I then measured around my wrist and cut off excess to make a reasonably clean cuff. Then, spray paint them gold. After they were thoroughly touch dry I peeled the sticky back off and placed the vinyl on some material for comfort. Simple yellow ribbon threaded through some cut holes/ slits at the back of the cuff close to the edge meant I could get my hand in and out of the gauntlets while still maintaining their shape. In order to make the earrings, use red star beads from the Bead Company hot glue gunned onto an earring base. Vinyl again this time cut to half circle my head and in the shape that WW has now of the dual sharp points. Then, red star bead in the center secured with regular super glue. If extra glue drips on the tiara, just paint with a brush and some gold paint to cover glue stain. I then cut two small holes on either end and threaded a stretchy band between them so it would sit on my head in the right place comfortably. I used various pictures of Wonder Woman from the current Warner Bros television cartoon show Justice League as my inspiration and I did little bits of the costume every day for about a week so that I had time to let the paint dry etc. Altogether I would say the whole thing would have taken a couple of hours. 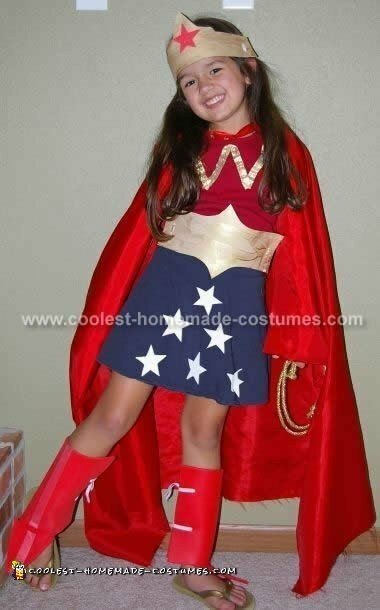 This Wonder woman costume is made from luxurious nylon/lycra fabric that allows ease in fit. Hand appliquéd eagle on top with rhinestone eye. Top is sewn to curve the bust line. Bottoms are royal blue nylon/lycra fabric with hand-cut and hand-stitched PVC star appliqués which adds shimmer to the piece. A zig-zag stitch was used to stabilize stars. Tiara made with double interfaced gold metallic fabric and adorned with red PVC hand-appliquéd star and fastens with Velcro to adjust fit. Belt and arm bands also made the same way and are fastened with Velcro to adjust fit in waist and arms. Edges are edge-stitched to keep form. “Real working” gold metallic lasso looped and fastened to belt with a gold holster to remove the lasso at will and use in order to make them tell the truth! Tips are encased tightly and ends are hot-glued to prevent any fraying. Beautiful authentic looking cape made with satin to enhance flow of cape. Cape has approximately 30 to 40 red, white and blue stars. Cape is approximately 56″ in length, (Adjust for your height). Capes now have sequins and beads on each star! 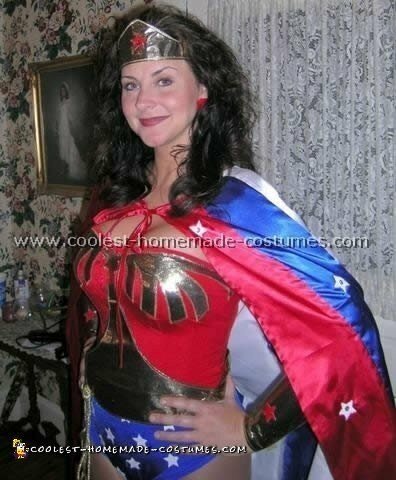 The top and pants of this Wonder Woman costume are made from luxurious Nylon/Lycra fabric that allows ease in fit. I then hand sewed an eagle appliqué on top with Swarovski rhinestone on eagle’s eye. Pull-over top is sewn to curve the bust line. It is made from quality Lycra fabric that has stretch to keep top securely on. Bottoms are royal blue nylon/lycra fabric with hand-cut and hand-stitched PVC star appliqués. Use elastic waistband for ease in fit. Tiara made with interfaced gold metallic fabric and adorned with red PVC hand-appliquéd stars and fastens with Velcro to adjust fit. Tierra trimmed with gold braided trim that really sets it off. One center red sequins and gold bead on star. Bugle beads added to outside edges of star. Belt and cuffs also made the same way and are fastened with Velcro to adjust fit in waist and arms. “Real working” gold metallic lasso looped and fastened to belt with a gold holster to remove the lasso at will and use in order to make them TELL THE TRUTH! Cape has approximately 20 red white and blue stars hand-sewn on with generous red tie closure in front. Cape is approximately 56″ in length. *Capes now have sequins and center beads on each star-each one sewn on by hand. Sets the cape off beautifully! Boot tops made with quality red faux leather and white stripe on front. Elastic bands hold the boot tops onto your street shoe underneath. 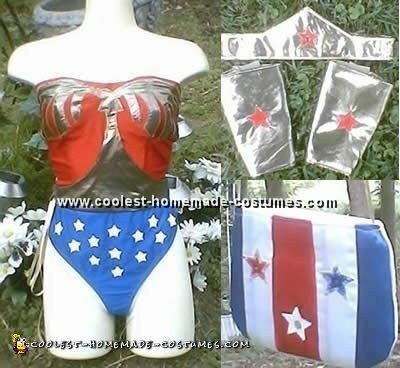 This Wonder Woman costume is made to last and with the “utmost” attention to detail. Especially relevant, are the quality fabrics that are chosen for lasting durability and luxury of costume. Add this one to your collection of costumes to show off to your friends. A sure winner at your Halloween costume contest! This costume takes a few days to make, it’s time consuming but well worth it. I make them all the time for people. It’s my favorite one. 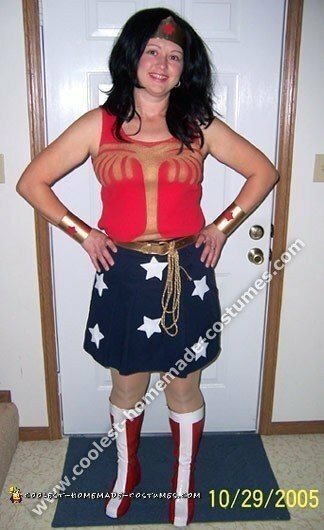 I was inspired by request to have this Wonder Woman costume made by an internet user. I used quality fabrics and made the pattern pieces myself. Top and pant made with Nylon/Lycra fabric, cape made from satin, stars were cut out by hand and sewn on that also include a sequins and center bead. The costume took 3 days to create. I have added a matching handbag for the invisible plane keys (included) and other necessities such as keys, etc. I wore the costume for Halloween 2005 and won first place. After visiting a theme park and meeting an actress dressed like Wonder Woman, my kindergartener fell in awe. We looked in the gift shop but the costume was $45. I promised her we’d spend the next day at the craft store and make her an even better Wonder Woman costume. The top is a simple red tank top with gold ribbon sewn on in a ‘W’ pattern. I used foam board to make the stars on her skirt, her bullet proof cuffs, her belt, her boot covers and her crown. I found a red scrap off of the clearance fabric rack that we used for her cape. A little bit of gold trim makes a perfect truth lasso. Now all I have to worry about is our household cat being forced to tell the truth about who knocked over the houseplant! 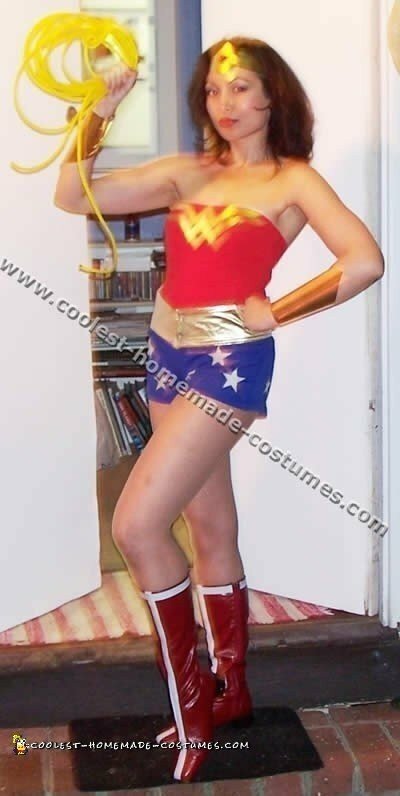 Wonder Woman costume by Sue W.
I love fancy dress and have always wanted to dress up in a Wonder Woman costume! The photos show the finished costume that I made to wear to a friend’s 40th birthday party. I bought all the items separately, mostly from eBay. I made all the gold accessories such as the headdress, the cuffs, the belt and the eagle on the corset from a child’s gold PVC jacket. 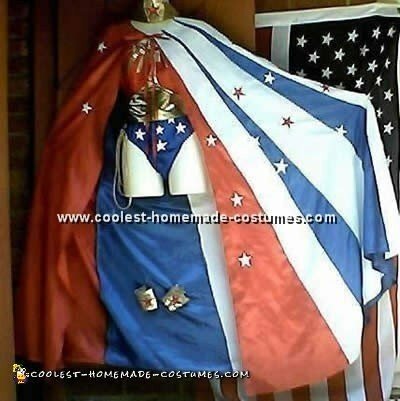 In order to make the cape, I used a large American flag with two panels of red satin sewn to the sides. And then decorated it in gold, white and silver fabric stars. The blue knickers were decorated with white stars of varying sizes at the front and back. I made a ‘truth’ rope from shiny gold braid and attached it to the belt with more gold PVC with a red stick-on-jeweled star as a decoration. In addition, the headdress and cuffs were also decorated with glittery gold/red stars. I was thrilled with the final result. I may not have the figure of Linda Carter but I truly felt like a super heroine on the night! Hope you like it! This costume was so easy to create. The basic items needed are a blue skirt or shorts and a red tank top. In addition, I also used a black wig, red and gold spray paint, white fabric and white duck tape, manila folders, sticky Velcro, boots, a belt and gold cording. I went to Goodwill and got a blue skirt and a pair of black boots for the costume. Then, I cut out white stars and sewed them on the skirt and spray-painted the boots red. It took several coats, so start early. After they dried I put white duct tape around the top and down the middle of the boots to make the strips. I cut out a crown and cuffs from the manila folders, but any heavy cardboard would do. Then I spray-painted them gold. In order to make the cuffs stick together, I used Velcro. Then I stapled the crown to fit my head. After that I made a stencil for my shirt, spray-painted it and my belt gold and at the end, put it all together. Finally, the most expensive item for this costume was the wig.